Maria Montessori understood that true education addresses the whole child, body, mind, and spirit. Just as the child needs to work in order to develop his body and mind, he needs spiritual work as well. Your child is capable of a rich spiritual life. He was made to know and love God. And if you are laughing at the idea of your goofy and (maybe even naughty) 3-year-old having a deep relationship with God, don’t! He was made for this! Catechesis of the Good Shepherd is designed to help every single child – every high-energy, timid, silly, and yes, even naughty, child- to become lifelong friends with Jesus. The Montessori method shows us that the child carries the seed of learning within himself. The seed which leads her along the path toward maturity, fullness, and independence. The seed which gives life. Catechesis of the Good Shepherd helps your child listen to God working inside him. 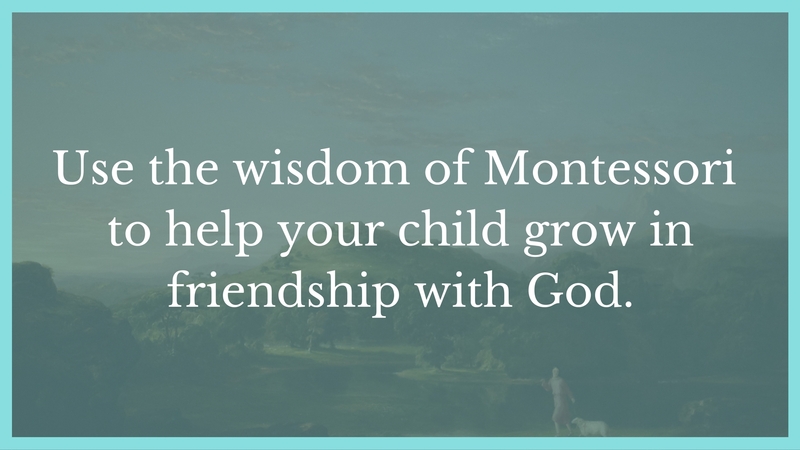 I want to help you help your child become lifelong friends with God. And if you agree that the single most important gift you can give your child is a relationship with God, who offers grace, wisdom and joy, then let’s chat. Set up a prayer table and prayer routine in your home. Learn how to effectively read Scripture with your children. Understand the importance of quiet work for the spiritual life of your children. Help your children become interested in the Mass. As a Level 1 Catechist, I am trained to work with children ages 3-6. I volunteered in a Catechesis of the Good Shepherd atrium from 2014-2015. Almost nothing in this whole wide world brings me more joy than passing my faith on to children. You may be wondering, what denomination is this for? Here’s another beautiful aspect of Catechesis of the Good Shepherd: it’s for all Christians. It focuses on the key facts of Christianity (the Word made Flesh, God’s plan for human salvation, etc.) and can be tailored to each denomination. Catechesis of the Good Shepherd was developed in the 1950’s by Hebrew and Scripture Scholar Sofia Cavaletti and by Montessorian Gianna Gobbi. You can read more about the history here, and about it’s method here. I would like to stress that I am not offering Catechist training! I am merely offering advice for nurturing your child’s spiritual potential in a home environment. Check out the free, printable prayer cards in my resource library below. Catechesis of the Good Shepherd uses prayer cards like these throughout the liturgical year. They are set up on the prayer table and read aloud to guide reflection. Print yours today!